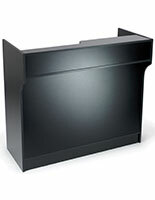 This glass front cash register stand combines a high-visibility display case with a functional point of purchase counter. 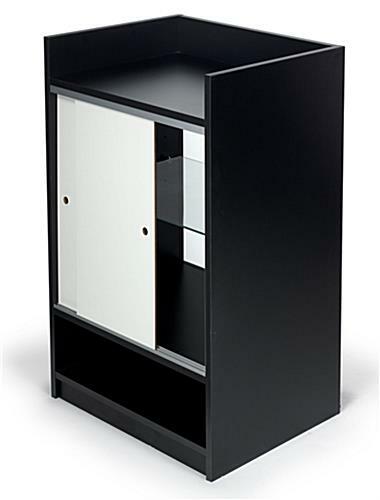 Each black laminate checkout fixture features economical particle board construction with a melamine finish. This 38" tall cash register stand is standard retail countertop height and can be used as a freestanding display or as part of a cashwrap configuration. 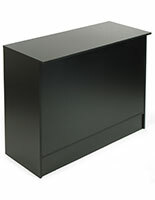 Each black finish counter has a recessed ledge top that can hold point of sale equipment or function as a workspace as needed. 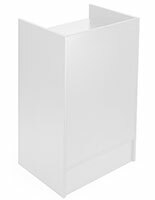 The cash register stand also includes a tempered glass front and adjustable height internal shelf for merchandise or product displays. 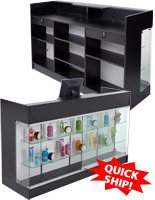 This versatile sales or service counter is an excellent choice for retail, hospitality, and service environments. 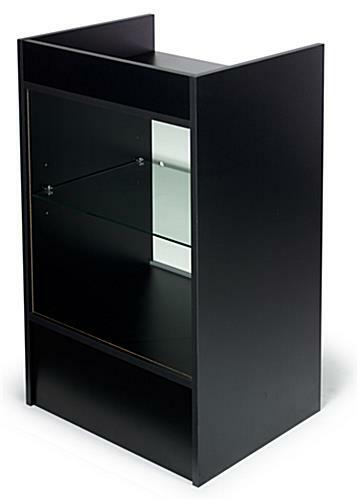 The display register stand has opaque rear doors for staff privacy and to focus customer attention on the shelf contents. 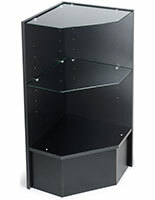 This type of combination showcase and checkout fixture is ideal for busy high traffic environments. 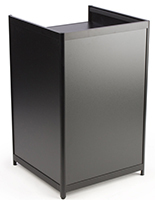 This black finish cashwrap stand with enclosed merchandise display is an economical choice for stores, restaurants, galleries, salons and other service businesses. 24.0" x 38.0" x 17.5"